I’ve noticed EarthBound prices getting really crazy over the holidays – people were trying to sell complete sets for over $1000! The craziness is slowly starting to subside, but not entirely, as there are still many prices $700 and higher. I’ve noticed that EarthBound prices get especially high over each holiday season and then slowly drop afterward – although never fully getting as cheap as they were pre-holidays. So if you’re hoping to get a copy of the game, avoid buying during the holiday season! 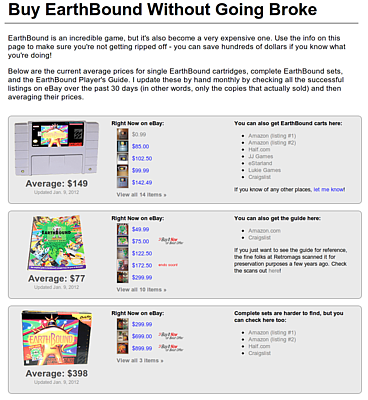 Also, to try to bring some sanity back into EarthBound prices, I made a page that’ll keep track of average prices of EarthBound cartridges, guides, and complete sets – my hope is that it’ll at least help a few people avoid getting ripped off. Check it out here! I’m also looking for other online sites that might carry the game, so if you know of any let me know and I’ll add them to the page. I got Earthbound for £40. A new 3DS game goes for about £35. Mato, don’t you mean 5th birthday? EB Central’s been running since 2008. =p Either way, happy birthday! More on-topic, it’s awesome that you made a site like that as a price guide. It’s so hard to find good deals for used games on the Internet. I sold my copy of Earthbound and the Earthbound Player’s Guide for around $40 on ebay a while back. Had no clue it would jump in value like that. CrouchingMouse: No, I started EBC in January 2009 – when I created the site I also took a bunch of EB posts from my personal blog and moved them over here. I would assume that Earthbound would be alot less then before on the holiday season. Wouldn’t you lower the prices on Christmas? I wish Nintendo would just re-release these games so everybody can afford them. I know I paid $300 for my set and half that for the M3 deluxe box fortunately enough which is still more than it should’ve cost. are there ever enough people selling just the box or any of the inserts at any given time to bother collecting data on that stuff? Actually, the box does sell by itself somewhat often, but I didn’t think it was important enough to include. If there’s demand for it though I can add it to the page. Mato, I am currently on the lookout for the right big box at the right price. They go for a little more than I’m willing to pay usually. At least the nice condition boxes. Buy It Now usually around $150 recently, no? It seems slightly more common to see some sort of “display box” auction with traditional SNES-sized boxes. I assume these are mostly bootlegger boxes or whatever, but I don’t know. I don’t pay attention to them. The page looks awesome. Great work as usual. I rarely see the OFFICIAL DISPLAY BOX with “Display Only” tag. Maybe those are more common than I thought. So keep an eye out for some around that price. Most of the boxes that were up for sale the last 30 days didn’t sell because they were too much. So with some patience you can probably get one for half the price of some buy-it-nows. Fair enough Poe. I agree…custom is a much better word. I’d grab them too if I didn’t have so many other EB items on my Wish List. Has anybody seen the manuals? I’m intrigued by them for sure. The more I think about it, the more I think maybe I should pick one up for this spare cart I have right now. Thanks for the advice Mato. I’m just glad I got Earthbound for $100. I payed $59.99 for Mother 1+2 It IS in japanese so I don’t understand anything but still better than paying $150.00 for EarthBound by itself. As a resident of Onett, I recommend you visit the Police Station and ask Captain Strong if you can borrow his copy. If he says no, just smack him with your baseball bat and stuff it under your Mr. Baseball Cap while you hide out at the arcade…. …how did you not think of this already? FMC: That’s the problem I asked him for it and he says he hasn’t finished it and wants to! How can you not consider EarthBound a rare game? What is your definition of a rare game? 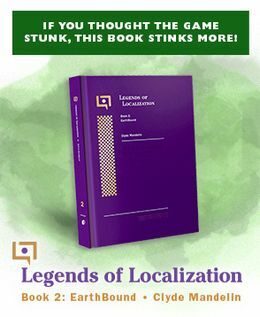 EarthBound didn’t sell too well meaning there are only so many copies in circulation. Many of those copies have probably been lost or destroyed since 1995 farther lowering the supply. I saw this on Starmen.Net yesterday. Everyone’s definition of rare is different, but for me rare means you have to struggle to find it, or at least for it to only be available every so often. Like the NES Championship carts or the Star Fox Weekend carts. EarthBound had a much larger run and has many more copies available at any given time, so I don’t consider it as rare as sellers tout it to be -you can comparison shop between many dozens of copies of EarthBound. That’s just my take on it though, I understand where you’re coming from. ^I understand what you mean, a game shouldn’t be called “rare” when there are 30+ listings of it on eBay at any given time. I feel so sorry for my brother… He actually has the game, the box, everything in it… But I broke his guidebook back when I was a little kid.